Here are some notes to help achieve the maximum enjoyment from drinking cellared champagne. Make sure that your bottles of champagne are stored within the ideal temperature range – a consistent 10–12°C (50–55ºF) with high humidity to prevent cork shrinkage. If there is no perfect cellar or storage room, bottles should not be stored in or near the kitchen or near a window. The temperature should not rise above 16–18°C (60–65ºF). If you buy champagne in a box, store it in that box, so its insulating properties will provide some protection from temperature fluctuations. If cellaring, store champagnes as low to the ground as possible, as it will be cooler there. Bottles should not be stored long-term in a refrigerator, where corks can dry out, causing gas to escape, possible leakage of the contents, and exchange of the contents with oxidation-inducing air. However, the lower the temperature above freezing, the less likelihood that signs of deterioration, such as brown coloured champagne, will occur. Ensure there is sufficient humidity (ideally, humidity should be 80% or over) by placing a dish of water in the storage area. You may need to buy a hygrometer, the instrument used to measure humidity. Avoid damage from light by retaining original wrappings and boxes. Champagnes in clear glass bottles, such as Roederer Cristal, should always remain in their ultra-violet protective paper, which is provided to give additional protection to the wine. Ruinart blanc de blancs should remain in its box for the same reason. Store champagnes away from machinery, in order to avoid vibrations. Allow champagnes some time to recover from agitation caused by transportation before drinking them.My preference is to store bottles horizontally, as it makes better use of cellar space, although British wine writer Tom Stevenson feels that even if the bottles remain upright the pressure of the gas in the bottle provides sufficient humidity for a cork to remain moist, while reducing the possibility of cork tainting the wine in the bottle. Before storing a bottle horizontally, Forbes recommends that it should be held horizontally, then its neck gently dipped 45 degrees before being raised again, exactly as in secondary fermentation, so the air bubble is forced towards the centre of the bottle. This is a precaution to prevent the cork drying and shrinking. Maintain a good cataloguing system and stock control to prevent delay if you need to fetch a bottle quickly. Keeping a copy of the cellar list and a diagram of the wines’ storage position is a prudent measure in case of flooding (when bottles may lose labels) or an insurance claim. When deciding which bottle to drink, remember that half-bottles mature faster than 750 ml bottles, which in turn mature faster than magnums and larger bottles. The larger the bottle, the slower the maturation, because the area of the surface of the champagne (which could have some exposure to a little oxygen via the porous cork) is smaller compared to the volume of champagne. Ensure systematic stock rotation so that you drink the appropriate – i.e., mature wine at its peak – bottles first. Consult the champagne’s maker for recommended cellaring time; this information can usually be found on the website. This information applies to NV as well as vintage. Producers who disclose information such as disgorgement dates on the label are doing us a great favour, as we then know how long the champagne has been stored on its cork, even if we don’t know the year of the main component of NV champagne. Otherwise I always note the year of purchase in my cellar record, for example ‘N14’ means NV purchased in 2014. Regardless, be aware that champagne ages well, whether NV or Vintage. Purchase champagnes from a reputable supplier who has stored the wines well. If you live in a warm country, or your champagne has been shipped to you via a warm or hot area, check how the wine was imported. Champagne deteriorates in hot conditions, so it is vital that it is transported in a temperature-controlled container between Champagne and you. When drinking a bottle, make notes on its quality. This will help with future buying decisions, from both retailer and importer. Check stored champagnes regularly. You should be able to spot if there are problems. For instance, cork fly moth can permeate a cellar from just one affected bottle: the moth lays its eggs on the cork, into which the caterpillars tunnel as they feed, and if the cork is fully penetrated, oxidation of the contents will result. Look out for silverfish, too, which can flourish inside boxes and devour labels, while rats can wreak havoc on corks. Leakage of liquid is not a good sign, but the shape of champagne corks, the muselet and their covering make it less likely than with other wines. Excess dampness can cause the labels to become spotted, or mould to grow on them. This detracts from the presentation of the champagnes.If the wine is not properly stored its quality will be affected. Below are some of the reasons you may find a bottle disappointing when you taste it. Excess heat will ‘cook’ all wines. Wines age faster at higher temperatures while, vice versa, the colder the temperature, the more slowly wine matures. If a bottle of champagne is exposed to extreme heat at some point, the wine expands in the bottle and some effervescence may be lost as a result. If the cork shows leakage along its length, it is almost certainly caused by excess heat. If the wine comes into contact with air – generally because the cork has dried out and allowed air into the bottle – oxidation occurs, and the wine becomes a darker colour and eventually turns completely sour. Agitation can force the release of the dissolved carbon dioxide – the bubbles. This increases pressure within the bottle, resulting in some gas seeping out through the cork. Loss of fizz means loss of excitement, anticipation and ready bouquet. ‘Tired’, lifeless champagne can be caused by too lengthy refrigeration. If the fridge is used to store both wine and food, foreign aromas can pass through the cork and spoil the champagne. Champagne served by the glass, as is common in restaurants, may be flat and stale if the bottle has been left open too long; ordering a piccolo (200 ml) or half-bottle may be a better option. Exposure to ultra-violet light causes hydrogen sulphide to form in the bottle. Such champagne suffers from gout de lumière: the bouquet is unpleasant, like wet wool, cardboard, or old cooked cabbage, and the wine tastes rancid. Other results of exposure to light are oxidisation and madeirisation, where the wine turns prematurely flat, musty and brown. 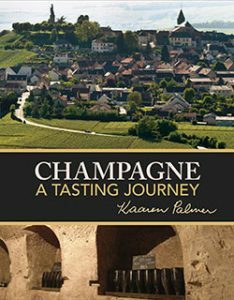 Stale, musty champagnes are the result of poor storage ventilation, which allows odours to permeate the cork. Ullage is caused by lack of humidity in the cellar, causing corks to dry out and shrink, losing their ability to fit the neck of the bottle snugly, and permitting slow evaporation of the wine. This especially applies in warm, dry climates. Too high a proportion of air in relation to the quantity of the wine accelerates oxidation.